Increased flooding in a warming world. In a simple statement of physics ’ the atmosphere can hold 8% more moisture for every 1C increase in temperature’ and if the temperature has risen 0.85C then there should be 7% more moisture already and this should show itself in more rainfall. Its not as simple as that. NIWA the New Zealand National Institute of Water and Atmospheric Research have research (explained here) that shows that we are getting increased rainfall on the West coast and less rainfall on the East coast and this is due to changes in the strength and persistence of the prevailing West wind. The long range prospect for Kerikeri on the East coast of Northland, New Zealand should be for less rain and increased drought and the records prove this is correct and yet anecdotally we appear to be getting more flood events. 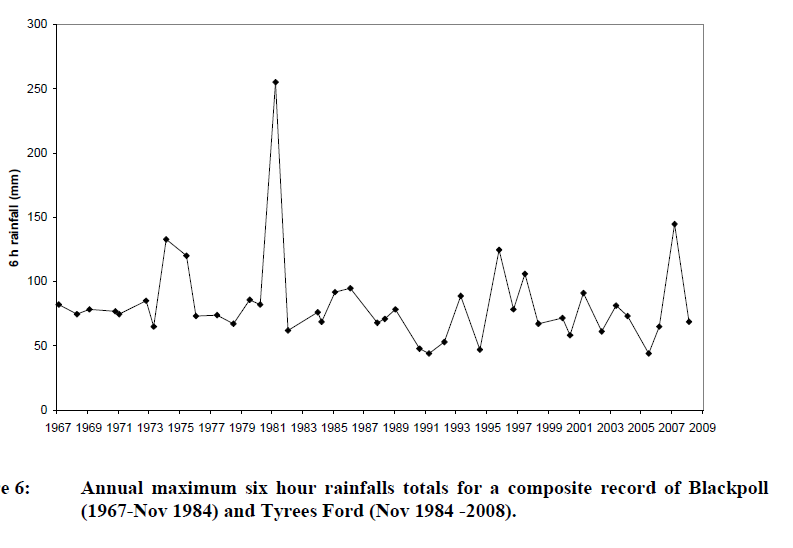 An examination of two recent flooding events, to discover the element that caused the flood, shows that it was not necessarily the amount of rain that fell, although it was very wet, but rather the rate at which rain fell within a particular event. To put rainfall locally into perspective we get about 1533 mm of rain a year, so it is quite a wet region, and a very wet day would be 100 mm or more. Another measurement is that moderate rainfall is 1 mm an hour and 6 mm an hour is a heavy rainfall which in total could give 144 mm in 24 hours. In our biggest recorded event of note it rained at 47 mm an hour for 8.5 hours which totaled 400 mm but as the gauges flooded this was an estimate. To get at the real detail of a rainstorm you need good long term hourly records of rainfall rates and this is where we are lacking. Electronic 24/7 record keeping is relatively new and there are very few records of more than ten years. My assessment of the situation is that, while it is not getting wetter overall in our region, with more moisture in the atmosphere the rain will fall in heavy bursts within a rain event. 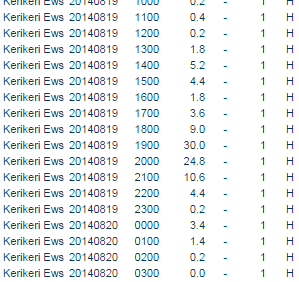 This may only last two or four hours but during that period it can rain at 20 mm or 40 mm an hour or even more. This sudden deluge can overwhelm river banks and gutters and this weight of water can do structural damage. It is these really heavy bursts that give river water the speed and destructive power to erode the banks and carry soil and trees into the estuaries and damage our fish breeding grounds and shell fish beds. 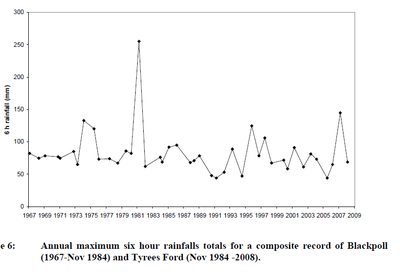 Using the Kerikeri River as an example, we have had four major rain events with the following characteristics. The first event was spread over two rainy days and so can be counted as one, but on the 9th July at 2300 it rained at 30.4 mm an hour and at 19.8 for the next hour and again on the 12th July at 0000 hours it rained at 26.5 mm an hour and the following hour at 20.9 mm an hour. These events caused the rivers to overflow. 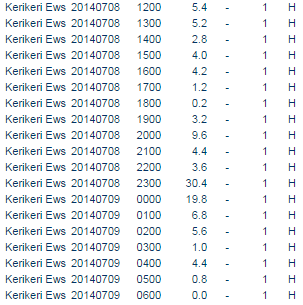 ﻿The second storm was on 20th August and at 1900 it rained at 30 mm an hour and the following hour at 24.8 mm an hour. What appears to be critical is the rate at which the rain falls in and hour rather than the total amount of rain in an event. If rain falls at 25mm an hour or more you can expect a damaging flood. To illustrate the difference that the increased rainfall rate can make to a river and the damage that it can do can be seen in the following illustrations. When the river fills up and starts to become a raging torrent it will straighten its course and cross over any low land that stands in its way. 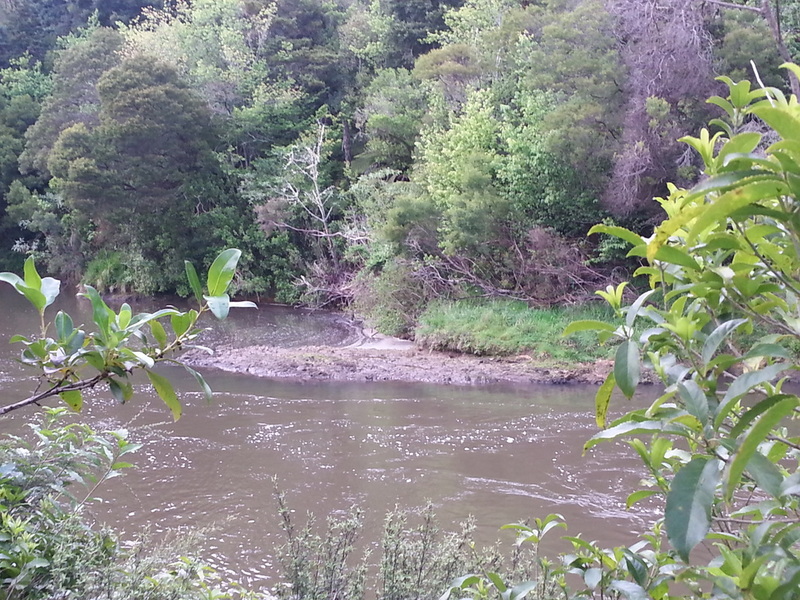 This picture shows the upstream side of the oxbow bend and the horizontal logs in the bushes are about 10 metres above the normal water level. The flood goes across the neck of land and scours mud from the ends of the pond and dumps the mud in a bank on the opposite side of the main river. This mud will eventually join the rest of the sediment deposited in the estuary and it is swamping the oyster and mussel beds and turning these fertile aquatic areas into a sea of mud. This bed of oysters is now completely dead as are all the other shell fish and seaweed in the upper reaches of the estuary. It takes 1000 years to make 3 mm of topsoil and we are losing very quickly. The UN forecast that it will all be gone in 60 years unless we change our land use habits. While the cause of this is largely due to intensive farming the evidence of the loss is clearly visible in our estuaries. This piece of text from a New Zealand research summary document explains neatly the part forests play in reducing floods. in streams through their extensively developed root systems (Allen et al. 2013), with undisturbed forest being most capable of minimising soil erosion due to its developed understorey. The total volume of water flowing from areas covered in indigenous forests is also lower due to their ability to intercept water via their large canopies and varied vegetation components (Brown et al. 2005). Consequently, native forest catchments are likely to have lower peak flows and higher low flows than unforested catchments, providing more stable water quantities in rivers (Fahey et al. 2004; Blaschke et al. 2008; Allen et al. 2013). In this modern world, we have cleared most of the forests to make room for farmland and houses and we have drained the wetlands for fertile farmland and not surprisingly we now have more floods and are losing topsoil at a substantial rate. ​Here is a map of the Waitangi catchment area that shows the network of streams and rivers that cover the region. There are of course hundreds of smaller feeding streams that are not shown. What is needed is a solution that replicates the function of the forests and wetlands to absorb heavy rainwater as it falls and release it over several days. Digging more ditches or deepening and straightening rivers only speeds the waters downhill and causes more damage and topsoil loss. One solution is to build a large number, possibly hundreds, of small dams on as many small tributary streams as possible. Each dam would have a small hole in the bottom so that it can fill naturally in a rainstorm to retain the water and then the water will drain out over several days and be empty and ready for the next rainstorm. Smaller dams are much less intrusive and costly than big engineering ones, even though a large number are needed. This avoids the fast dumping of rain into the rivers that causes floods and so much damage.